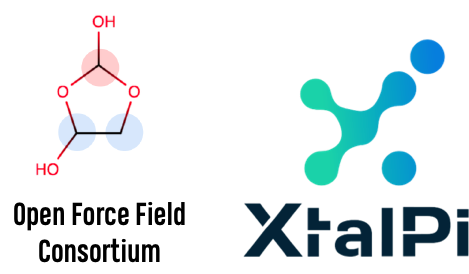 The Open Force Field Consortium (OpenFF, openforcefield.org) and XtalPi, Inc. (xtalpi.com) seeks a Distinguished Postdoctoral Fellow to perform cutting-edge research in a unique academic-industrial joint effort. OpenFF is an academic collaboration (based at UC Irvine / UC Davis / UC San Diego / Univ. Colorado Boulder / Sloan Kettering Institute in New York) that seeks to develop next-generation molecular mechanics force fields and associated parameterization software and data infrastructure. XtalPi is a pharmaceutical technology company founded in 2014 that is introducing revolutionary advances in drug research and development, and has established strategic partnerships with several major pharmaceutical companies and recently completed a Series B funding round with Sequoia, Tencent, and Google. The Postdoctoral Fellow will work with OpenFF and XtalPi to improve the accuracy of molecular mechanics force fields for predicting crystal structures and binding free energies. The work spans the disciplines of force field development/validation and Bayesian inference, and seeks to answer the fundamental scientific questions: 1) What regions of chemical space are critical failures for current force fields? 2) What are the fundamental limitations of (a) current functional forms and (b) parameterization methods? The position spans a two-year project period that involves a gradual transition from the OpenFF side to the XtalPi side. In Year 1, the Fellow will be hosted for ~9 months in one of the academic groups (to be determined by the OpenFF PIs, XtalPi, and the Fellow) and ~3 months at XtalPi in Shenzhen, China or Boston, MA. In Year 2, the time division will be 3-6 months academic / 6-9 months XtalPi. The Fellow will be considered for full-time employment at XtalPi after Year 2. For more information, see the full job posting.